Do prairie dogs do The Wave? This is Sandra Tsing Loh with the Loh Down on Science, saying, Yup! Or rather, Yip! 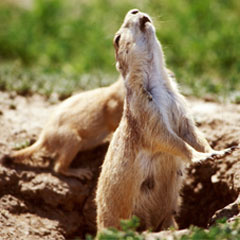 Prairie dogs, which are actually a type of rodent, live in towns of dozens of families. They share resources, watch each others’ backs – And, sometimes, do something that humans reserve for sports events. An individual springs into the air, forelimbs held high, and screams “WEE-oo” as if celebrating a touchdown. This triggers neighbors to do the same, and it spreads through town like The Wave through a stadium. What gives? Enter James Hare from the University of Manitoba. He videotaped prairie dog towns in Canada and the U.S. and noticed a pattern. Prairie dogs that initiated the so-called yip behavior foraged more than usual right afterwards. And they kept grazing so long as others caught the wave. When a wave fizzled? They stopped eating. Hare thinks yips measure group vigilance. Only alert neighbors can participate. Spark a strong wave? Folks are paying attention to their surroundings. Any hungry predators will be spotted. So it’s a good time to eat some bugs! Hot dogs with yellow mustard optional.